Stormwater can provide a toxic discharge which can enter into a lake, river or coastal water system. As storm water flows or snow melts, it picks up debris, chemicals - such as fertilizers and pesticides - dirt, willdlife excrement, cigarette butts and other pollutants. This stormwater is usually discharged to a lake, stream, river, creek, wetland, or coastal water, potentially polluting our fresh drinking water supply with a variety of harsh hazardous elements. Oxygen-robbing runoffs such as phosphorous and nitrogen can choke the life from fresh water lakes. Stormwater is funneled directly from stormdrain systems into our waterways with no treatment..
Stormwater run off from a construction project is another problem source. What is stormwater? Stormwater is water from rainfall or snowmelt that doesn't evaporate or infiltrate into the ground, but instead runs off, either into the storm drain system or directly into our rivers, streams and lakes. Increased amounts of impervious surfaces, such as rooftops, driveways and parking lots, increase the amount of stormwater runoff. Isn't stormwater treated? Oftentimes not. In many cases, stormwater is funneled directly from the stormdrain system into rivers, streams and lakes without being treated. Why is stormwater a growing problem? The increasing and rapid rate of urbanization. Development and construction severely alter the hydrological functioning of the landscape. Soils are compacted by construction equipment and grading. Trees and vegetation are replaced by extensive areas of impervious surface, such as roofs and pavement. 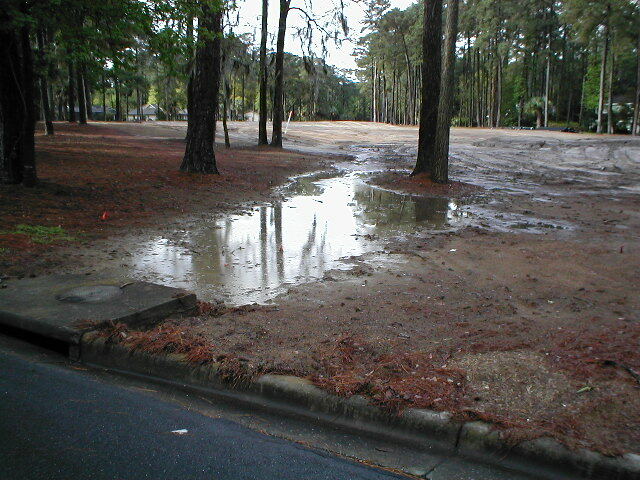 Compacted soils cannot infiltrate water as effectively, impervious surfaces prevent water from being absorbed into the ground, and there is less vegetation to soak up, store, and evaporate water. The result is that less water is absorbed into the ground and more runs off as stormwater. 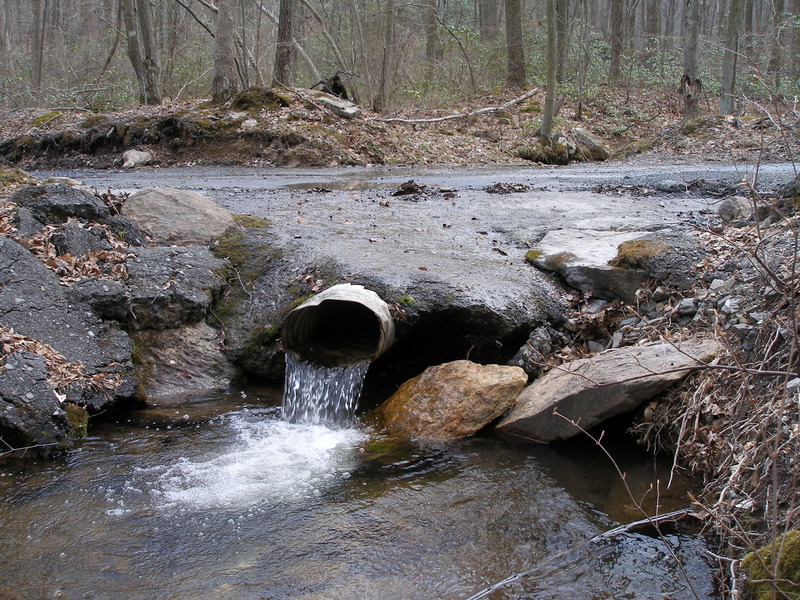 What pollutants are in stormwater? Heavy metals and toxic chemicals, including oil and pesticides, which wash off streets, driveways, lawns, and fields. Nutrients, especially phosphorous and nitrogen, from landscaping, leaking septic systems, and agriculture. Sediment, the largest pollutant load in urban settings, results in high turbidity water, which is harmful to aquatic life. What problems does stormwater cause? Prevents groundwater recharge: Stormwater runs off, instead of seeping into the ground and recharging natural ground water aquifers that people depend on for drinking water and stream recharge. Human health: Stormwater picks up bacteria, chemicals and pathogens that can cause illness. In areas with combined sewer systems, it can also overwhelm water treatment systems, causing raw sewage overflows. Aquatic wildlife health: The health of fish, aquatic birds and other marine animals is threatened by nutrient-laden stormwater, which causes bay-choking algae growth and low levels of dissolved oxygen, and erosion and sedimentation that can destroy aquatic habitat. Recreation: Swimming, fishing and boating on local water bodies can be dangerous and unpleasant due to pollution. In Washington, D.C., swimming in all rivers and streams is illegal due to stormwater pollution. Aesthetics: Physical characteristics of water bodies, such as color and smell, can be affected by stormwater pollution, and litter from streets is carried directly into lakes and streams by the storm drain system. Increased volume and velocity: Stormwater volume increases can overwhelm stormwater systems, resulting in flooding, sewage releases, and property damage, and in conjunction with increased velocity, results in streambed erosion and large sediment deposits. Erosion: One of the worst results of increased volume and velocity is erosion. Erosion not only results in property and stream bed damage, it also can result in loss of fish and wildlife habitat and reduced water quality and clarity from down stream deposits of the eroded soil. KENT - The town's official Web site touts Kent's "many beautiful lakes, ponds, reservoirs." There's no mention of those water bodies making the town an Eden, but they do, according to the town's recent effort to curtail pollution. "This place is paradise ... and clean water is key," explains the talking head in the first of four, public-service announcements that try to enlist Kent residents' help with cleaning up storm-water pollution. The series of announcements, each about two minutes long, will soon appear on Kent's Web site and on local cable television. Commissioned by the Town of Kent Stormwater Committee and produced by committee member Jeff Green, the spots explain what storm water is and why residents should be concerned about it. The committee unveiled the short videos at a recent community meeting. "It's something people don't really stop to consider. They don't think about where water goes once it leaves it leaves their property," said Maureen Fleming, who heads the town committee. The videos explain in a simple and engaging fashion how rain or melting snow can wash lawn fertilizer, oil, gasoline or waste from a leaking septic system into lakes or streams and eventually contaminate drinking water. The "biggest problem now," the initial announcement says, is no longer factories dumping into rivers but storm water carrying the aforementioned pollutants, plus more. "So to keep you from swimming in potty water, a few years ago Kent's town board created a storm-water management committee. They've been studying the problem and they want you to know what you can do to help," Brett Winn of Titan Arts in Imperial Beach, Calif., explains in the first video. Most municipalities in the state must meet new, strict regulations aimed at keeping contaminants from washing into reservoirs and other water bodies. Education is one component of their storm-water management plans. Other facets include cleaning out storm drains, inspecting homes for failing septic systems or illegal discharges, and mapping all culverts, pipes and other structures carrying storm water. "It's educating the public on the importance of storm water and your drinking water," Supervisor Kathy Doherty said. The videos build upon the committee's public outreach at Kent Community Day, the 4-H fair and the Daniel Nimham Intertribal Pow Wow. Both Fleming and Green estimated the committee engaged at least 1,000 residents at those functions. The town paid $900 for the four announcements. "Hopefully, once we get them (the announcements) out and distributed, we'll be able to reach a lot more people," Green said. "Once we reach them, we can educate them and they'll begin the process of cleaning up." The first video provides a general overview of the problem. The rest touch on the threats posed by sewage and fertilizer and how a resident can control storm water. Although the topic isn't glamourous, the videos tend to be amusing. At one point, Winn swirls a glass of water and claims the bouquet contains "fertilizer, sewage and a hint of motor oil." "If you can entertain them, that's the way to grab them," Fleming said. Ever notice the green carpet of algae that creeps across some area reservoirs during the summer? It's not just unsightly, it's unhealthy. Those algae blooms deplete oxygen levels, choke fish, and give the water a foul odor and taste. 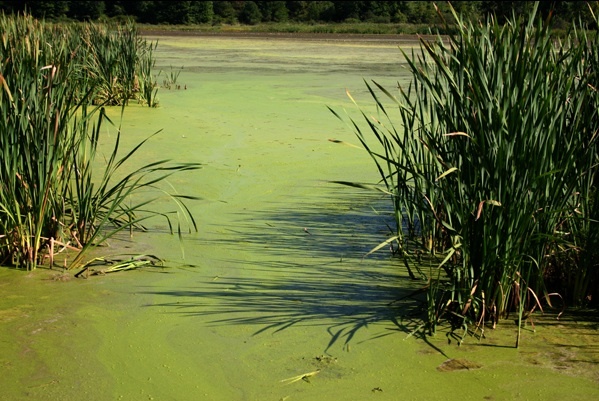 To make matters worse, algae transports germs through the reservoir system and interferes with chlorine's ability to disinfect drinking water. Not surprisingly, the state is taking aim at the culprit behind the ever-increasing algae blooms - phosphorus-laden stormwater. The state Department of Environmental Conservation is in the midst of tightening its stormwater discharge permit requirements in order to reduce the amount of phosphorus in the water supply. Phosphorus accumulates in runoff from animal and plant waste, fertilizer, failing septic systems and other sources. Under the new permit requirements, municipalities within the Croton watershed will face the strictest stormwater regulations in the state. There is good reason for the tightened regulations, considering that the Croton watershed provides 10 percent of the drinking water used by 9 million people in New York City and some suburbs. It's hard to argue with the need for a clean water supply, but this plan was proposed with little consideration for what it might cost the municipalities that make up the Croton watershed. Now, months after a draft set of requirements was released (known in industry jargon as "MS4 Phase II" requirements) and just weeks before the final set is about to be unveiled, state officials are finally recognizing that a regional solution is necessary, both to ensure consistency in the 300-square mile Croton watershed area and to reduce the costs for the individual municipalities in the watershed. A public benefit corporation, similar to one that is in place to oversee the much larger Catskill watershed area west of the Hudson River, merits further study. Funding for it would come from many sources; the watershed towns must not bear the entire financial burden. The Croton watershed stretches from New Castle to Pawling, covering 11 towns in Westchester, four in Putnam and one in Dutchess County. Eight of the 13 reservoirs in the Croton system violate federal water-quality standards, some with phosphorus levels that are 33 percent higher than allowed, Jim Tierney, assistant commissioner for Water Resources for the state Department of Environmental Conservation, told the Editorial Board. To reduce the amount of phosphorus in the reservoirs, all of the sewage treatment plants within the watershed have been outfitted with new, sophisticated equipment. New construction projects are required by the state to build stormwater drainage ponds in order to prevent runoff, and those permit requirements are being tightened now as well. But the hardest task is still ahead: retrofitting all of the municipal stormwater systems to reduce runoff, and creating systems that allow water to be cleansed by letting it seep through the ground en route to brooks and streams. The state's goal is "to turn off the little spigots of phosphorus," Tierney said. The new requirements, which were announced in draft form in December and are expected to be finalized in April, are varied: Some involve high expense items, such as retrofitting storm drains, building high-tech oil/water separators and mapping stormwater routes. Others might be less costly but require a daunting change in procedure, such as a requirement to bag leaves instead of collect them on the side of a road, and sweeping streets regularly. Still other requirements are just baffling, said Mary Beth Murphy, Somers town supervisor and chairwoman of the Northern Westchester Watershed Coalition, representing 11 towns; for example, the requirement for towns to oversee that homeowners routinely check their own septic systems. Septic systems now fall under the jurisdiction of county health departments. "This is an enormous undertaking," Edward Barnett, Putnam County watershed information coordinator, told the Editorial Board. "It has an unrealistic timeframe, it lacks an equitable funding process and there has been no estimate for what it will cost regionwide." The benefit of forming a public benefit corporation would be many. For one, it would eliminate the duplication of costs and services that would likely exist if each municipality only looked after the stormwater within its own boundaries. Also, the corporation would likely be eligible for grants from various state and federal agencies that are concerned about water quality. In addition, New York City has $4.5 million earmarked for Croton watershed preservation, and that could be put toward the formation of a public benefit corporation, Tierney said. While the details and the funding of a public benefit corporation still need to be explored, it is imperative that the costs for a cleaner water supply should be shared by all of those who drink the water. Who would have thought that something as simple as wasing a car, changing the oil in a car, bathing a dog outdoors or making a garden could produce water pollution? The idea may seem farfetched, but that's exactly what happens when things like oil and grease, soaps and fertilizers are washed off roads, bridges, parking lots, rooftops and other impermeable surfaces by runoff from rain or melting snow. Most of us assume that the runoff goes through storm drains and into a water treatment plant, but that’s not the case. As it flows over these surfaces, the water picks up dirt and dust, rubber and metal deposits from tire wear, antifreeze and engine oil that has dripped onto the pavement, pesticides and fertilizers, discarded cups, plastic bags, cigarette butts, pet waste and other litter. These contaminants are carried into our lakes, rivers, streams and oceans. Nonpoint Source Pollution: The result of such runoff is called nonpoint source (NPS) pollution because it comes from many varied sources. Stormwater runoff rivals or exceeds discharges from factories and sewage plants as a source of pollution throughout the United States. Roads, highways and bridges are a source of significant contributions of pollutants to our nation’s waters. Some of the contaminants found commonly in stormwater discharges include heavy metals, such as copper, zinc and lead, which have been shown to cause health and reproductive problems in pregnant women and children, as well as oxygen-robbing nutrients, such as phosphorus and nitrogen, which can choke the life out of streams, rivers, ponds and lakes. Additionally, stormwater is a major source of bacterial contamination in coastal zones, leading to beach closings and diseased shellfish populations. Lastly, high flows of rushing floodwater scour stream banks and beds, destroying habitat for aquatic life. Using Stormwater: Because humans create stormwater pollution, humans can reduce or prevent it through stormwater management, which aims to reduce the number of pollutants and to raise public awareness that stormwater is a valuable water resource rather than a waste product. Stormwater is generally not high quality, but with some treatment and preventative measures, it can be used for toilet flushing; car washing; irrigation of parks, lawns, playing fields and gardens; and fire extinguishing systems. It can also be used to supply hydrants; artificial lakes and wetlands for recreation; industrial cooling towers; and to recharge aquifers. • Reduce fertilizer use on gardens and lawns. • Don’t release used oil or grease into the environment, and clean up spilled brake fluid, oil, grease and antifreeze. Do not hose them into the street where they can eventually reach local streams and lakes. 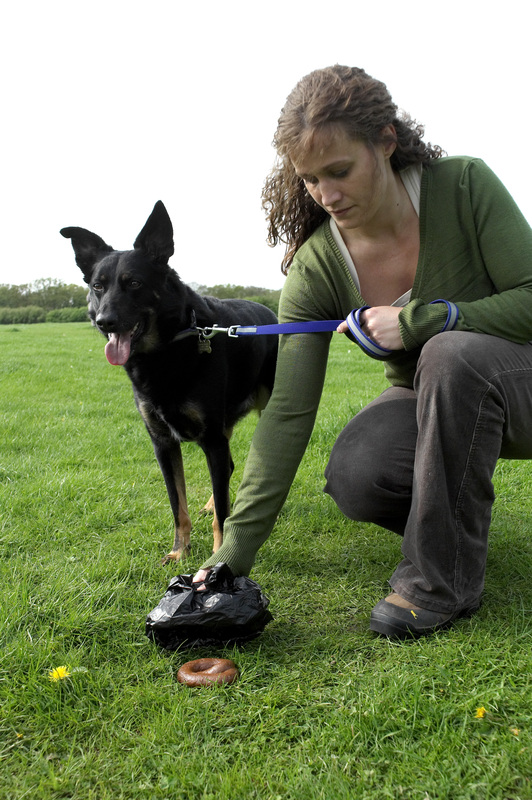 • Pick up dog and animal feces from your yard or when walking your dog or pet. • Don’t wash your car where the detergent water can run into the lake. • Keep litter, pet wastes, leaves and other debris out of the lake environment. The need to protect our environment has resulted in a number of pollution-control laws, regulations and programs at federal, state and local levels. For example, in 1987, Congress established the Nonpoint Source Management Program under the Clean Water Act. These programs recommend where and how best to use management practices to prevent runoff from becoming polluted. The programs also explain where the runoff is polluted, to reduce the amount that reaches surface waters. We all can play a hand in preventing runoff pollution by getting involved. It is up to us to take the steps necessary to keep our waters clean — regardless of the weather.